Posted by Steven Bartus in Desserts, Foreign Cuisine, Turkish Cuisine. As my time in Ankara comes to a close, it’s fitting that I finally got around to visiting one of the restaurants often cited as the best in the city: Trilye. Like Kalbur, it specializes in fish, which continues to strike me as amusing since we are in the middle of Anatolia. If you told me before I came here that Ankara’s best dining would come in the form of seafood, I would have never believed you. Nevertheless, Trilye is the real deal, a gastronomic delight worthy of acclaim. Trilye departs from the norms of Ankara dining as soon as you climb the steps into the indoor-outdoor dining room. The ambience is eclectic yet refined. Centered around a tree draped in blue lights under a large canopy, the decor manages to strike a strange balance between fine dining and New England beach cottage. Ceramic fish and nondescript ocean scenes adorn the walls, while dark-wood paneling and dim lights set the mood. The eccentricity extends to the clientele. On a packed Saturday night, the crowd represents a fascinating cross-section of upper-class Turkish society. Dapperly dressed gentry bump elbows with tee-shirt-wearing, chain-smoking young hipster types who are seated next to whole families complete with boisterous children. There are exceedingly attractive women daintily picking at their food with their less-than-comparably attractive male companions. The man sitting next to us last night was either dining with prostitutes or happens to have two beautiful blond-haired daughters who dress as if they are always in a nightclub or cocktail lounge. 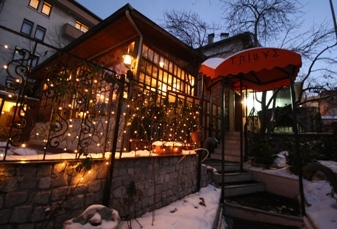 All in all, Trilye offers personality, something that is all too rare in the Ankara dining scene. Early in the night, Süreyya Üzmez, the owner and head chef, mingles with the diners. Dressed in a bespoke tan blazer and crisp shirt, he effortlessly chats up regular customers and first-time visitors alike. Üzmez walks with the grace and confidence of a man who knows he’s about to impress a room full of people with his food. As business picks up, he retreats to the kitchen and dons the white chef’s garb, leaving his capable wait staff to tend to the full house. Starters at Trilye are selected in typical Turkish fashion from a tray of cellophane-wrapped samples. Although effective in its presentation, I find this approach to be less than elegant, unnecessarily cheapening the appearance of the food. From the 25 or so options, my friend and I select three. The best of these was the zucchini in yogurt. Topped with pine and walnuts and seasoned with dill, the taste was smooth and creamy, as complex in flavor as it was simple. The smoked salmon wrapped around another yogurt-zucchini mix and the stuffed pumpkin blossom were also quite good. All three exhibited a sophisticated approach to cooking that just isn’t common in Ankara. Both of our main courses were more traditional takes on seafood. The octopus, often a difficult item to prepare, was deftly grilled and avoided the gamy taste that tends to come from less-skillful kitchens. Although the portion was a bit small and the presentation lackluster, it was still a very tasty dish. The best of the two was the swordfish. Also grilled to perfection, it was everything you’d expect from a top-caliber fish restaurant. Our only complaint about these entrées was the price. At 20TL for the octopus and 50TL for the swordfish ($12.90 and $32.20 at 1.55TL/$), both felt overpriced. Without question, they were delicious and a testament to Trilye’s quality. But I probably wouldn’t order them again at such a high cost relative to the creativity that was put into them. Our dinner was concluded with two excellent desserts. The markonat pie, consisting of ice cream layers drenched with copious amount of melted chocolate, was simple but tasty. The chocolate soufflé, though, was most impressive. It displayed near perfect fluffiness, and the flavor was superb. This was a dessert that could confidently be served in almost any restaurant in the world. When I eat out, usually the best sign of a place’s quality is if I want to go back again. Not too many places achieve this status, but Trilye is definitely one of them. The menu is large, and throughout our dinner my friend and I saw many items go by that stirred up that ‘I-want-it’ feeling. And beyond the food, I ask you this: how many places in Ankara (or maybe even Turkey) can you see a waiter move from table to table cooking strawberries in liquid nitrogen? Trilye is located on Hafta Sk. off Reşit Galip Cad. in Gaziosmanpaşa. It goes without saying that you should come prepared to spend a lot of money, although the starters and desserts are quite reasonably priced, usually between 5TL and 15TL ($3.20 and $9.70). Alcohol is served, and reservations are required in advance (Telephone #: 0312 447 12 00). P.S. Exterior shot of the restaurant was nicked from the web. I forgot to take one of my own. Send ideas and suggestions for future posts toeatingankara@gmail.com. Breaking News: Live from Life!